I took off again. I went northward, through JFK, an airport I rarely use now (bad memories – including losing a toddler in baggage claim) to Boston. Not my final destination, I am briefly stopping over for two nights. My real destination is Martha’s Vineyard. Saturday (June 21, 2014) was our travel day. Gail, Jean, Jana and I drove to the Boston airport where we picked up Diane who flew in from Baltimore. From here we travelled in Jana’s car down to Woods Hole to get the ferry. Along the way, but still a long way away, we started to see “Steamship Authority” parking lots. Though Steamship Authority is the name of the ferry company we are using, we assumed these had nothing to do with us and referred to ferries to other places. We drove all the way down to the ferry dock at Woods Hole only to be told that to park we need to turn around and go back a little way up the road. No problem! We turned around and drove back only to discover that that lot was full, and now we need to drive 10 miles back to another lot. It just so happened that that lot was right where we stopped along the way for lunch and which we were sure was not for our ferry! Needless to say, we did not get on the ferry we had planned. Conveniently there was a shuttle from the lot back to Woods Hole, and we arrived with over an hour to spare for the next ferry. Fortunately, no one was in a hurry! 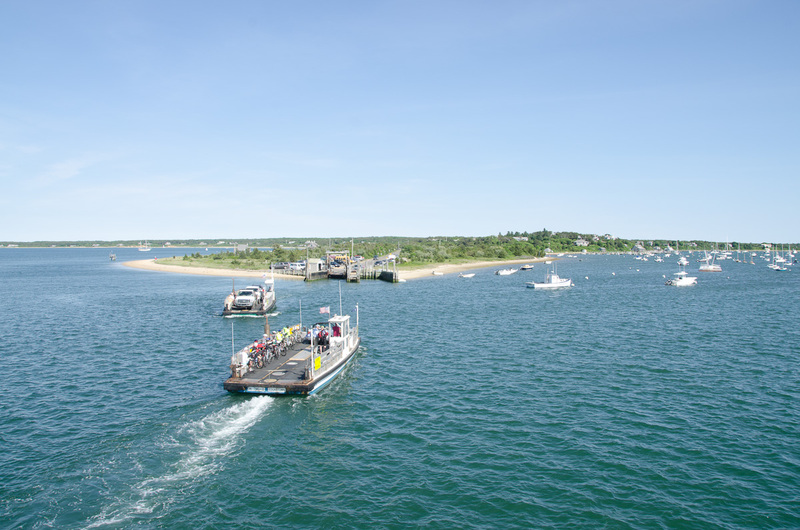 Arriving in Vineyard Haven, on Martha’s Vineyard, we split up temporarily to get our rental car (a six passenger van) and buy supplies for breakfast, leaving one person to supervise the luggage. Driving directions in hand, we braved (literally) the lawless traffic of Vineyard Haven and drove to our sylvan abode for the week. The house we are staying in. It is a private home, but rents out during the season. If you are interested, leave me a comment. 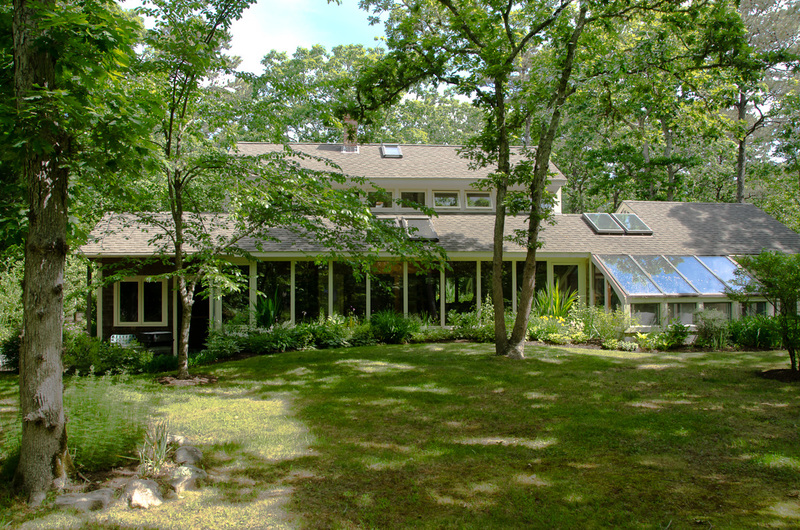 We are staying in a private house “up island” which means we are near West Tisbury and Chilmark. Our house sleeps six and is on a quiet road. It has a beautiful yard surrounded by trees. There are birds galore, and with the exception of the peacocks, all quite songful. Barely did we have time to get settled in before we needed to leave again to go to Oak Bluffs to meet Ann, who was coming from Baltimore via Providence, and to have dinner. With a purple and pink sunset as backdrop, Ann arrived right on time, and once parked (she has brought a car across with her on the ferry) we had dinner at the Sand Bar & Grille in Oak Bluffs. Walking along the road to the Artisan’s festival. to wood, ceramic and other materials. Our visit was June 22nd, and though the festivals began this year on June 8th, it was early enough in the season that we were able to enjoy the fair without a crowd. The town hall was right next to the fair. Now in the car and attempting to get to the southwestern part of the island, we followed the signs for Lobsterville and found ourselves for the first time at the beach. The parking is sparse and restricted so we could not get out and explore, but we could see the little town of Menemsha across the water. Aiming for that we had to turn around and go back the way we came, in what turned out to be a huge, long drive. 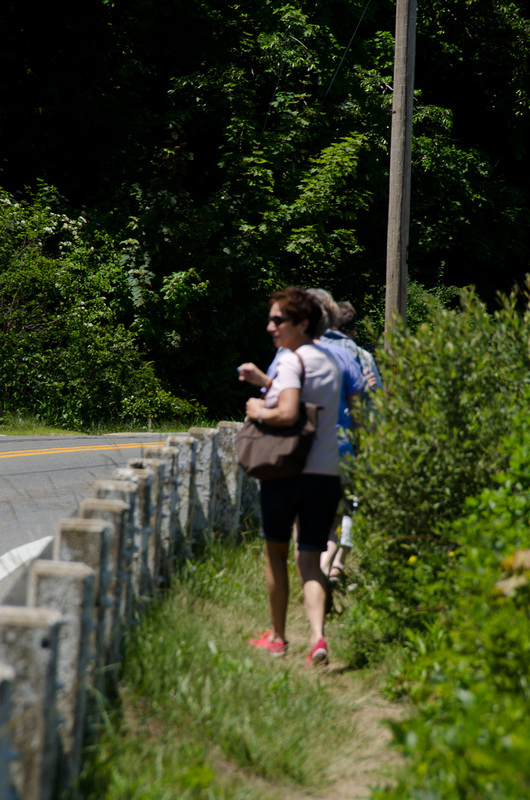 Since our route took us right past a place we had seen earlier looking for a lunch spot, we stopped and purchased sandwiches and pizza by the slice at the Chilmark General Store and then sat on their front porch to eat. By this point it seemed like a good idea to head home (we were close by) because we had big plans for that night – To eat lobster on the beach and watch the sun set. We ordered our lobsters from Larsen’s Fish Market in Menemsha (and Diane ordered a steak from the Chilmark Tavern) and about 6:30pm we headed back to the Menemsha beach to watch the sunset. We picked up Diane’s dinner first (surprisingly huge price tag…) and then our lobsters, Larsen’s being right at the beach. Carrying our chairs and food we walked the 100 yards or so to discover a beach full of people doing the same thing! We spread out with our beach chairs and towels, feasted on our dinners, and enjoyed a spectacular sunset complete with sound effects provided by other awed humans all around us. They even clapped at the performance. Thank you, God/Mother Nature! The lobster dinner on the beach was highly recommended to us and I will highly recommend it to you. Despite the temptation to just pick up your lobster and go home to eat in peace and quiet, the whole beach experience is a “happening” and a fun one at that. Lots of families as well as romantic couples, there were even other “reuning” (“reunioning?”) groups like ours. It was a festive, happy, family atmosphere that left us all feeling good about the world and thankful we didn’t succumb to laziness and eat at home. Monday we were longing for a nice, long hike. Our destination was Long Point Wildlife Refuge [a Trustees of Reservations Property] which is near where we are staying, but still required taking the car. The first entrance we tried was closed so we had to turn around and find another…but once we did, we found a place where we could park the car and leave it, enjoy the beach, a pond, the woods, the heath and the dunes all in a single walk. The “pond” it turns out is fresh water. It was here that we found most of the families and there were even little kids in the water. The ocean beach was pretty cool (talking temperature here) and though there were some people in the water, it was hard not to feel cold just watching them! The sun was out and the breeze off the water was cool so it was a perfect day for the walk we planned. As I mentioned earlier, the walk took us through a whole series of habitats along the water – beach, heath, dunes and woods. We saw many interesting plants and flowers, as well as a fair number of birds – including two swans who flew in from somewhere – huge birds in the sky – and settled on the pond amid the smaller geese and tiny (comparatively) gulls. We never got too close to them, so blown up images will suffice to prove that we did indeed see them. Still not really organized grocery-wise we had dinner at Lucky Hank’s in Edgartown. We had delicious food and the atmosphere was delightful, right down to the jelly jar wine glasses! this is the infamous bridge. When the accident occurred, the track was a single lane with just a 6″ barrier at the edge. Tuesday morning we went to Chappaquiddick. 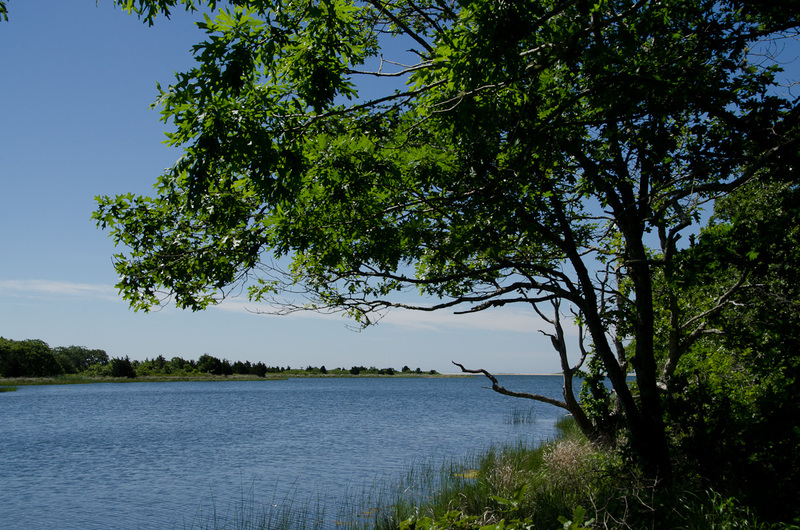 Told of a great hike near Cape Pogue Wildlife Refuge [a Trustees of Reservations property] , we drove to Edgartown, where we got in line for the little ferry to Chappaquiddick. Three cars at a time means the wait was substantial but the psychology of a frequently moving line kept our restlessness to a manageable level. Once on the ferry, it was a short hop to cover the distance and we were off and on the island. Trusting to our map (versus SIRI) we never did find Cape Pogue, but we found our way to the Wasque Reservation [a Trustees of Reservations property] where we hoped to get out and hike as well as see the beach. The young woman at the entrance was not at all well informed (on the job for less than a week), and told us that the only thing there was to do there was pay a fee and go to the beach for the day. When we asked about the trails, she said there were none, and even though we pointed to an arrow shaped sign that said “Trail”, we were told that there was no trail. [There was we found out later!] Instead, she sent us back to a Japanese garden called Mytoi, another “Trustees of Reservations” property. Turn around! We enjoyed our stroll around the Mytoi garden. We were fortunate to meet a curator who could answer all our questions about the various plants, and she recommended we visit Polly Hill Arboretum, which is also near where we are staying. (We added that to our agenda for the week.) The Mytoi garden is small, with many beautiful “keyhole” scenes, and a couple of big snappers and smaller turtles in the pond to delight the smallest people in your group. The Chappaquiddick Ferry ride takes about 3 minutes! Back across the ferry to the main island we had lunch in Edgartown at a place called Among the Flowers Cafe. Gorgeous salads were the favorite choice of the group! We were right in the busy part of the town and spent an hour plus after lunch shopping in the quaint stores. We also got to take a good look at the harbor and watch the ferries to “Chappy” (as they say here) from the roof of a structure near the little wharf. My lunch was a tomato and watermelon salad. 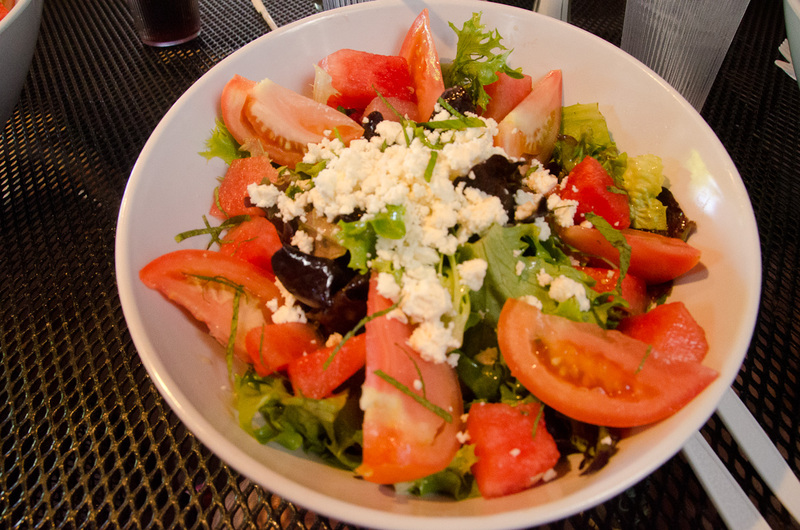 Though I hate pictures of food, I wanted to remember and recommend this salad. We got up early today. Unfortunately, departures are imminent. Jana left with Ann at 6:30 for the ferry back to Woods Hole, and Ann, herself, left about 11 for the car ferry from Oak Bluffs back to Woods Hole. Once finally out of the house and on our way to do something, it was noon. Lunch was the first item of business. We headed for a place called 7A Foods tucked in behind the Alley’s General Store (in West Tisbury) for sandwiches and drinks. Following nutritional fortification, we tackled the general store itself. “$5 worth of S*!t in a $2 bag!” was the very fitting description Jana coined for it. Amazing what you can find in there! It was fun to comb through and marvel. Next we went off in search of the Farmer’s Market. 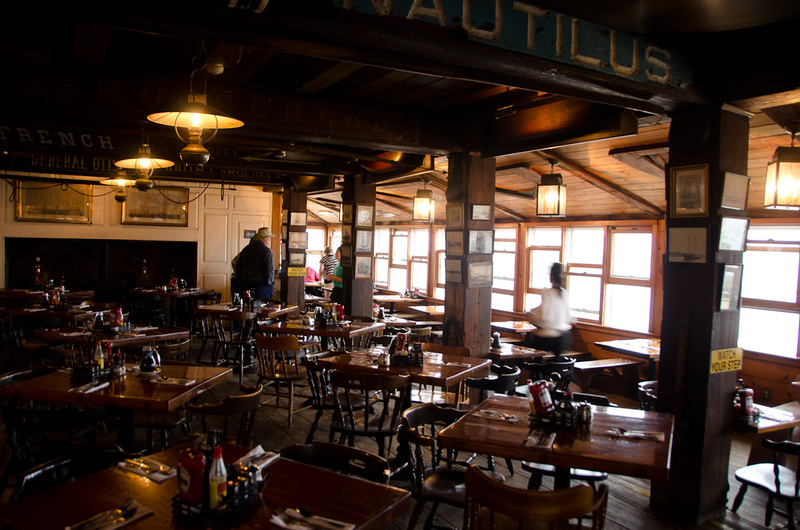 It is open in West Tisbury on Wednesday MORNINGS which it no longer was, so we missed that! We visited The Field Gallery (across the street from the General Store). This is an interesting building housing interesting art surrounded by a field of interesting outdoor statuary. The field was also hosting a bicycle group for lunch – an interesting juxtaposition of sports with art and certainly representative of the dual nature of all business owners in small vacation communities everywhere. (Do you get the impression I found it “interesting?’) We enjoyed looking over the art in the gallery. There was some truly wonderful work – prints, paintings, sculpture, jewelry and mixed media – that make the gallery worth a nice, long, look. Next, we blithely and naively consigned ourselves to SIRI’s directions to get us to the Polly Hill Arboretum. After driving for 15-20 minutes we arrived – at the Tisbury Public Works. Turn around! We went back the way we came, this time using our own maps, and we did indeed arrive without further incident. The arboretum was a treat for us; we have our personal horticulture expert (Gail) in tow! Especially notable for me was the “Dogwood Allee” which I find a contrived name for a walk bordered by flowering Korean dogwoods that create a beautiful canopy overhead. We discovered many flowering shrubs and trees that fascinated us and whose names we knew we would never remember (Thank you, Gail, for providing them in Latin!). Next, it was off to find some wine for dinner, and in one of those durned “Aha!” moments, we think it is a good idea to find the new package store “at the airport.” Mind you, that is all we know about it…that it is “at the airport.” Assuming it is at the commercial park near the airport we go there first and failing to find it, we ask…No, It is at the airport. Turn around! Back to the airport itself we went, and yes – we found it and provisioned for what we hoped would be two nights. Now just four, we cooked at home again, so no restaurant recommendations. We got up and out by 6:30 am to get a very anxious Jean to the ferry. After dropping her off to fend for herself, something we did with a bit of trepidation, we went to have breakfast at the Black Dog Tavern, right on the water. 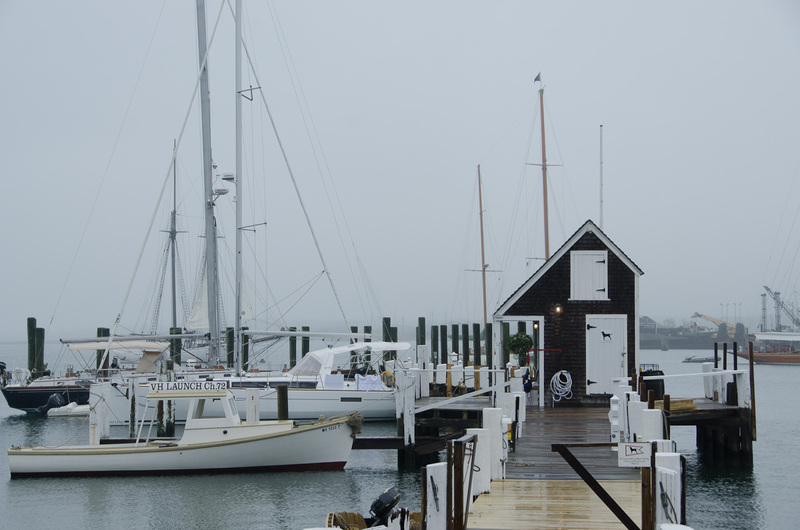 It was rainy and the view from the restaurant was quiet and tranquil, an effect of the fog-like mist. When it started to rain, the heavy drops falling into the calm water was a sight to remember. The Black Dog Tavern. It filled up quickly, but we were the first through the doors at 7:00 am. The Black Dog may be an obnoxiously ubiquitous franchise, but the breakfast was delicious and copious. The restaurant filled up almost immediately upon opening at 7:00 am, and the place was cheerful and cozy on a rainy summer day. Our waitress was excellent, smile always at the ready, and we had a wonderful breakfast on all levels. Of course, we visited the store afterwards. Obnoxiously ubiquitous or not, it is still a souvenir source that says “Martha’s Vineyard” and we weren’t going to miss it. We were looking forward to going back to sleep to make up for our early morning, and with a rainy day looming ahead, we provisioned for dinner and headed home. 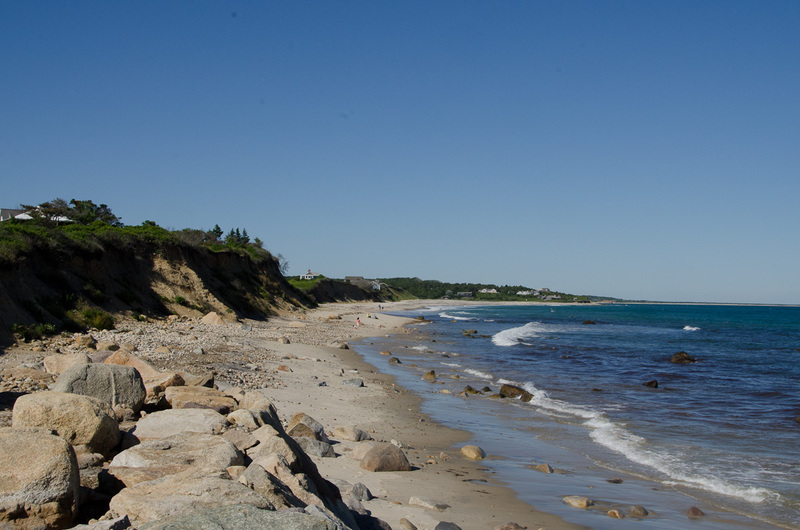 A quick detour along the way took us to the “Rec Shack” at the West Tisbury School to pick up a beach sticker … or not. The sticker costs $50 and we would be able to use it only for a single day (as well as “have” to stick it on the rental car), so we decided it was probably not a good investment. We did spend the rest of the morning in various leisure activities, yes, including snoozing. Tricked by a sunny patch of weather we got dressed and organized to go out. 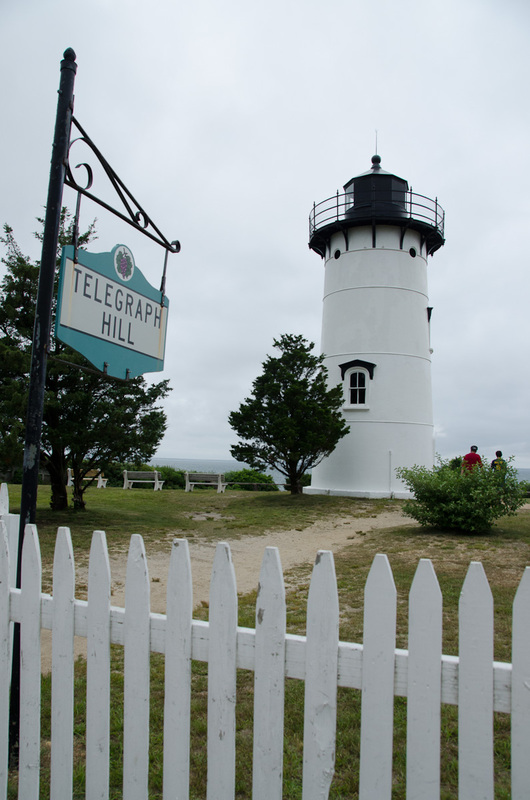 Originally we were going to go to Aquinnah, but upon discovering that the museum there is not open on Thursdays, we opted instead to drive the “Bend in the Beach”/ State Beach road up to Oak Bluffs where we hoped to find Wesleyan Grove and the Tabernacle. By the time we got in the car, the weather had deteriorated again, so a car trip turned out to be a good choice. Unfortunately, the weather as not bad enough to create any dramatic picture taking opportunities, but we did get to see the strand that stretches between Sengetontacket Pond and Nantucket Sound.. The air conditioning in the car was on and the waves along the beach were wild, so we had the impression that it was cold outside, belied by scenes of bathing-suited, wet-haired children on the beach and along the road. The area is definitely worth a visit. The houses are fascinating – though alike in the aggregate, they are so distinct in the particulars. Colors, shapes, trim, and gardens – each has its own personality and spark. 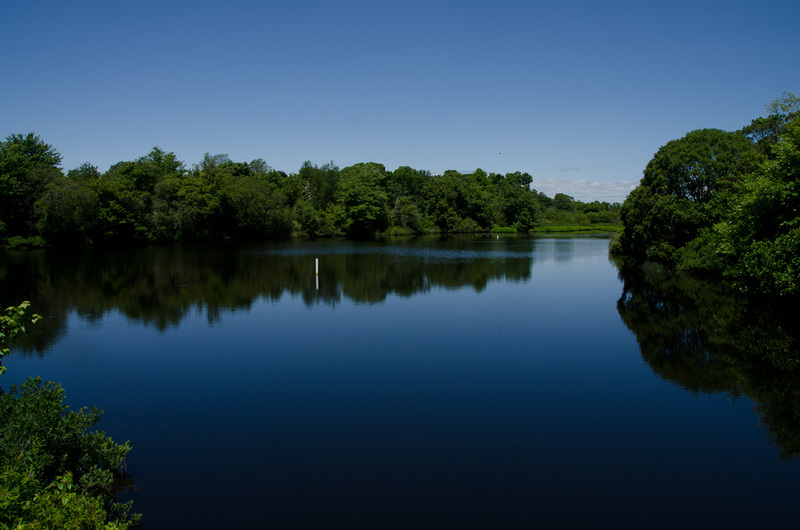 Look up the history of the area before you visit in order to fully appreciate what you’ll see. Already in Oak Bluffs, we took the opportunity to go to see the East Chop Lighthouse. The lighthouse is “OK” as a destination, but the route to get there took us through the “big house” neighborhood! That was well worth the detour and the drive. By the time we headed home, the rain was heavy. The weather really had cooperated nicely for most of the day. Our evening was accompanied by the sound of raindrops on the skylight, thunder rumbling in the distance, a glass (or two) of wine and Gail’s home-made turkey chili. The weather was back to beautiful. The best thing about a rainy day is the singular (day versus days). Gail and I went out for a power walk and explored the immediate area to the southwest of our house. Walking along the road we found a number of signs referring to a land bank. When our road ended we headed into the woods, walking south toward the beach, at another property with a land bank sign. There was no “No trespassing” sign. The sign it did have simply said that you couldn’t walk there during hunting season. So, feeling especially daring, we headed down the road. We were walking along a two track road, over-grown with vegetation but still serviceable. 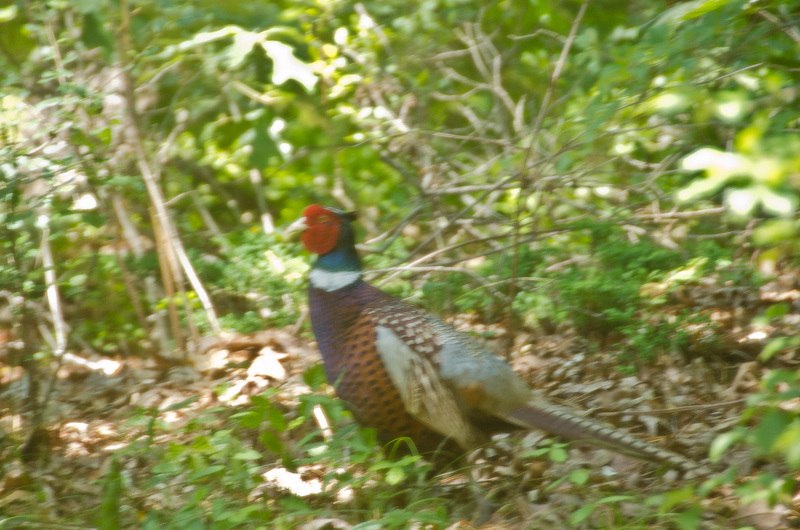 Soon we were walking next to a finger of the Tisbury Great Pond pond. The views were lovely and it was nice and cool in the woods. 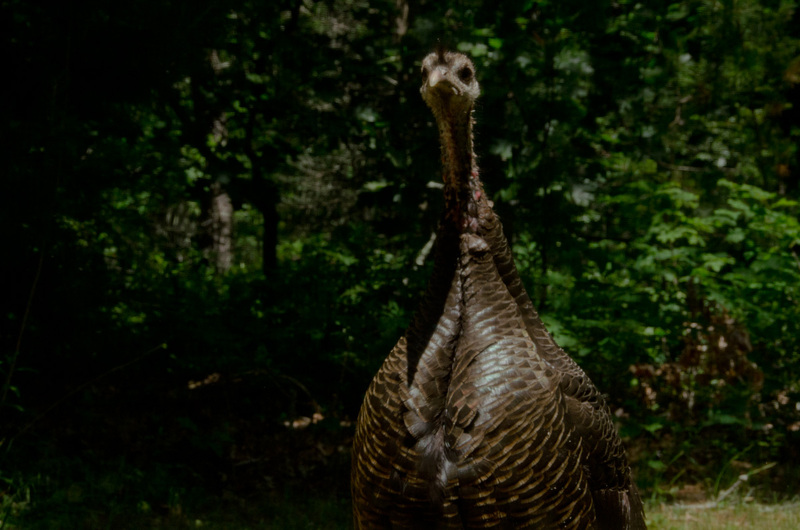 Eventually, searching for the boat landing, we found a young man (just on the job less than a week) who couldn’t really tell us where we were or how to get back to the road, but he did clue us in on the land bank, formally The Martha’s Vineyard Land Bank Commission. Basically it is a public organization that buys up land on Martha’s Vineyard for conservation, using money raised through property taxes. This has to be one of the most understated operations on the island. All these properties are open to the public and access is free. 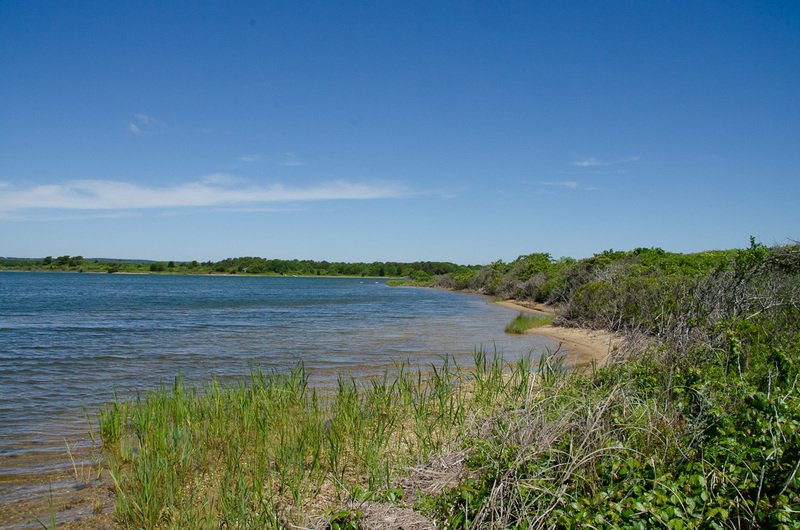 There are two other organizations on Martha’s Vineyard that preserve land. One is called the Trustees of Reservations (you will see above where I have mentioned them) and the other Sheriff’s Meadow Foundation, both of which are private. Here is a link where you can find out more about all three. Back at the house, it was now noon, and with a fridge full of leftovers, we tackled those. 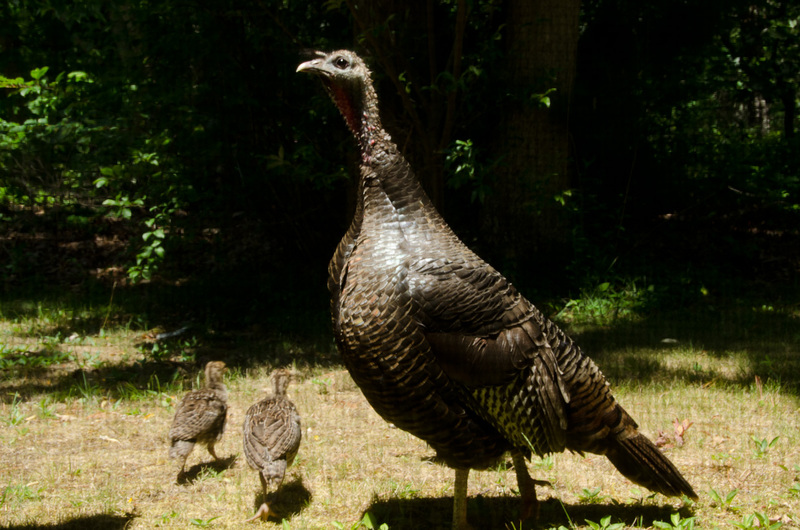 As we were eating lunch I was facing the windows to the garden, and I looked up to see a turkey hen peering in! Slowly everyone turned to look. We have visitors! Two hens, eight chicks and a male pheasant, who was tagging along behind like the au pair! We followed their progress around the house, racing from window to window with our cameras. The shots are not spectacular but the experience certainly was! The au pair. I had a male au pair too. 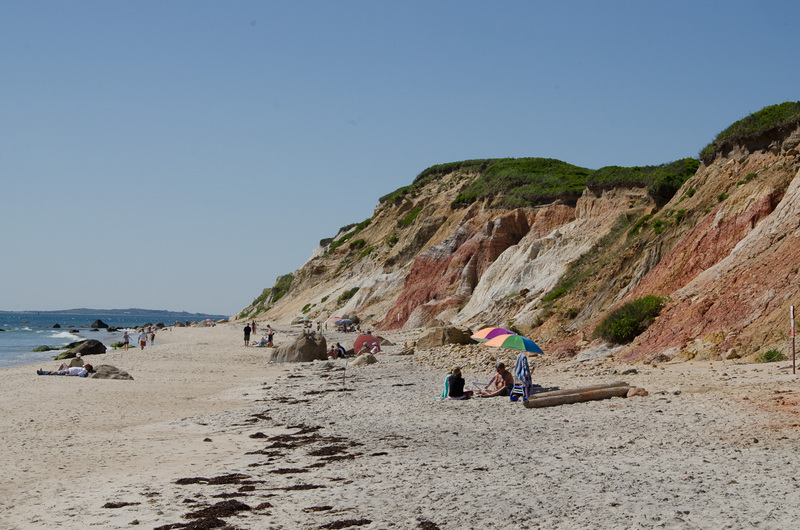 This is Gay Head (Gaily Colored Headland) in Aquinnah. Gorgeous! 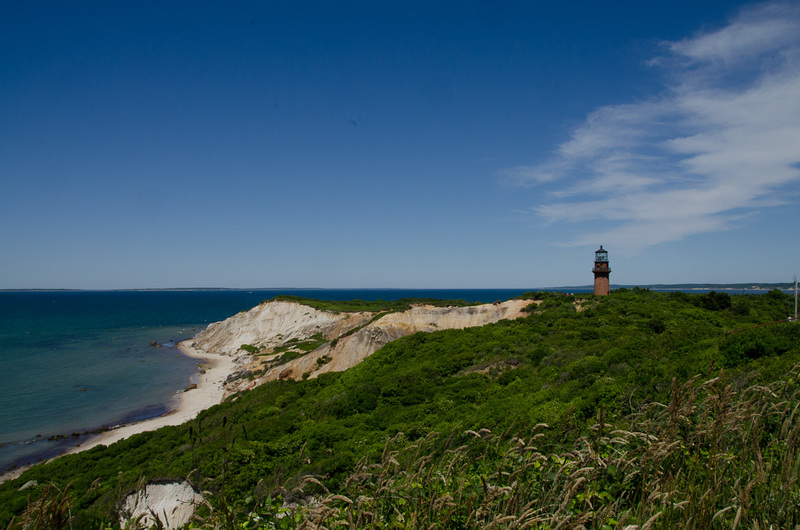 Today our destination was Aquinnah. A longish, but lovely drive through the Up Island countryside, this part of the island is far less habited than the areas around Oak Bluffs and Vineyard Haven. The landscape is a bit wilder, too. The Gay Head Lighthouse against a beautiful summer sky. Our first stop was the lighthouse itself. 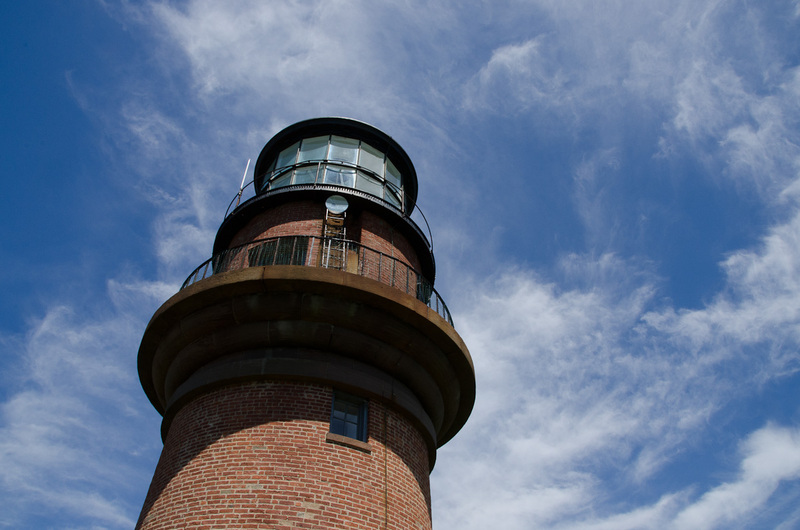 Perched precariously on the edge of eroding cliffs, the lighthouse is an old brick structure. A Save the Lighthouse campaign is underway, not to restore it (it is in fine condition) but to move it, back away from the edge of the cliffs. Judging from the view, they might have to do it sooner than later! Glacier strewn rocks and colored sand. From the lighthouse, we went down across the park to see the Wampanoag Cultural Center – which was neither what we expected nor what the sign seemed to promise! The Center is an historic house, built by a Wampanaog seaman in the 1890s in the style of the white settlers. 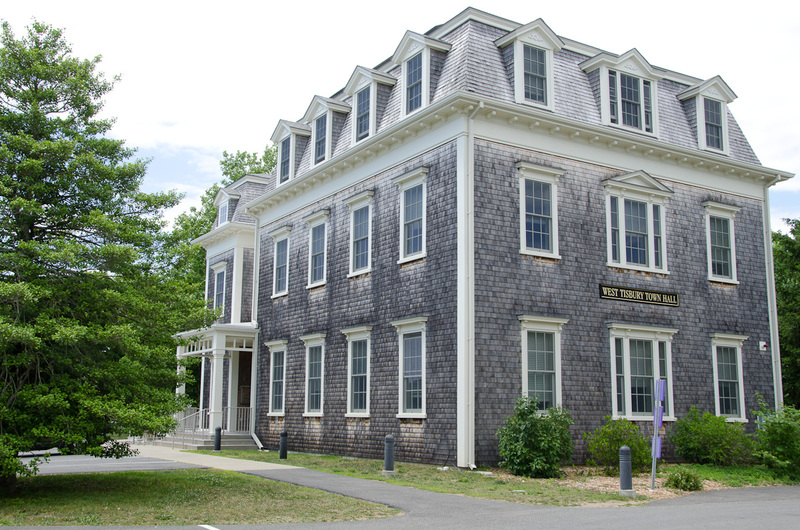 The museum houses family pictures, artifacts, and information about the Wampanoag mariners/whalers. Our guide was a descendant of the family and we liberally asked her a lot of questions about the Wampanoag, their tribes, and their current status. 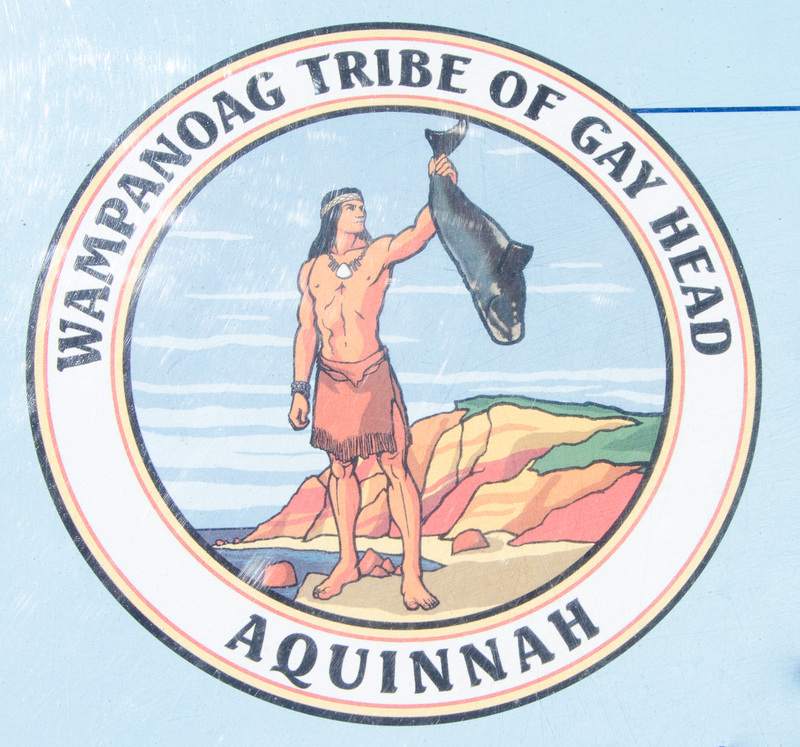 The emblem of the Wampanoag Tribe of gay Head, Aquinnah featuring the god, Moshup with a whale. The cliffs below us are made of clay. Their beautiful colors (red, yellow, tan and grey) can be used for pottery. We saw an exhibit in the museum of a potter whose work focused exclusively on this clay. Next stop is the beach below the cliffs. Once again we drove down to an access point only to discover that we had to turn around and go back to a parking lot nearer to the museum than the beach. A shortcut runs from the parking lot down to the beach so, thankfully, we did not have to walk back along the road. The beach is gorgeous. The cliffs loom up behind us to a deep blue sky, their colors brilliant in the sunshine. The water here is calm and the beach protected from the wind. Lots of people were sunning and swimming (including nudists). There are rocks along the base of the cliffs, left here not by erosion but by the glacier that created this headland. 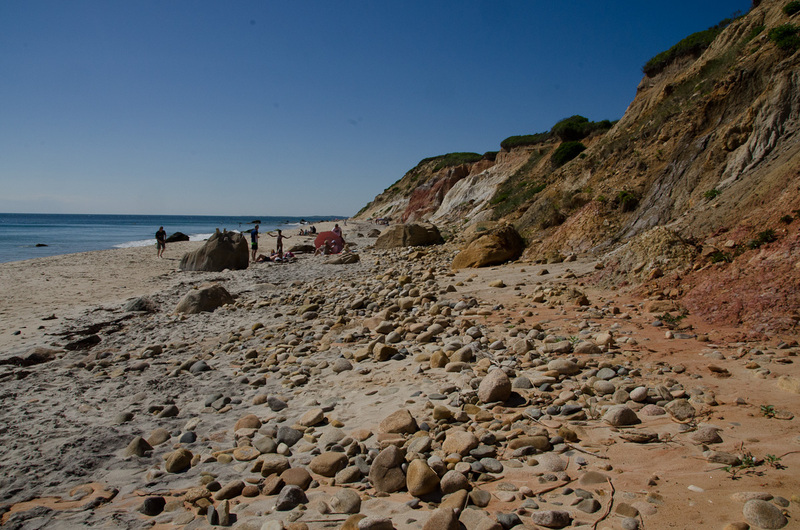 The clay from the cliffs runs down among the rocks staining the sand. In fact the name of the place “Gay Head Cliffs” is a shortened version of “Gaily Colored Headlands” according to our museum guide. Informed that we could get onto the Squibnocket beach after 5, we headed there next, arriving at 4:45. (How could we miss something with a name that is so muh fun to say?) We asked the guard for a bye for the 15 minutes, and she was unwilling…but following a little white lie (“Are you staying in Chilmark? “Um, yes.”) she let us into the parking lot. Maps are not very useful on Martha’s Vineyard, proof being the number of times we have turned around. Our map showed a road going down into the area called Squibnocket, but it was a private road – even gated! There was an exclusive development behind the gates, and we were there for the 5:00pm servants’ exodus (we imagined). 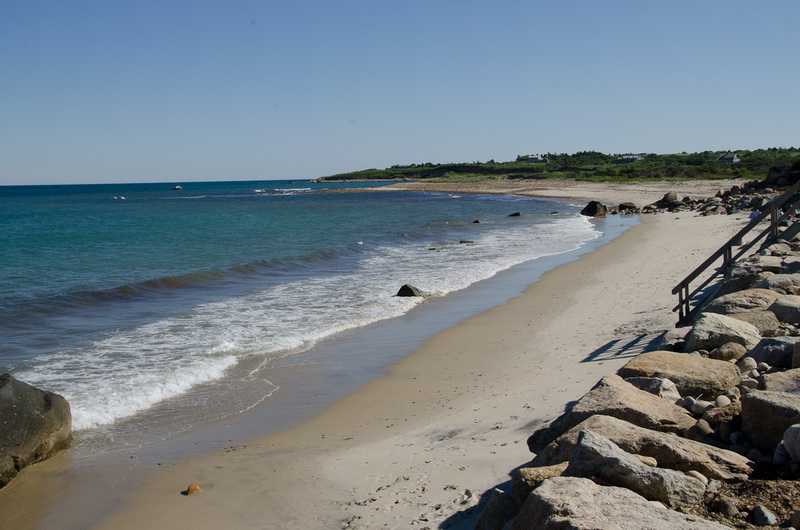 The beach stretches northward from a huge abutment of concrete boulders that keeps the parking lot from washing away. Like many of the beaches on the island this one is private. Remember the story of the beach pass we didn’t buy? Well you need one of those for any number of beaches on the island – each pass giving access to a single “residents’ beach.” The car next to us in the parking lot had about 12 stickers, covering various beaches and various years, proudly displayed like military campaign medals. A nice long satisfying day, we headed back to our house. Along the way we stopped at the Alley general store so that Gail could use the ATM. 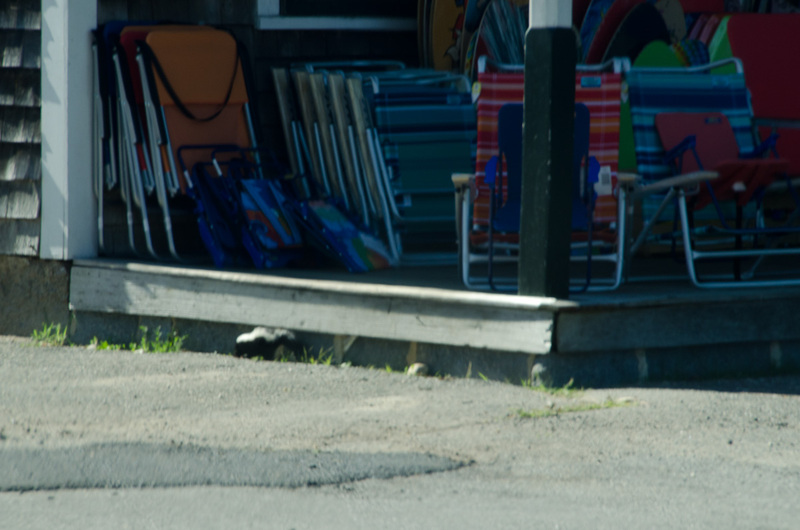 From our vantage point in the car, Diane and I watched the people coming and going from the store, unknowingly stepping right over a baby skunk who was scavenging at the base of the step! We called Gail’s attention to it, and after her startled jump backward, she whipped out her phone and posted a picture of it. For dinner, we returned to Lucky Hanks and had another very good dinner. Tomorrow it is clean up and move out. We have a long day of ferry, bus and plane travel to take the three of us, separately, back to WI. ‘Til next time, Martha’s Vineyard. We had a great time!